Save time and make your administrative tasks easier. 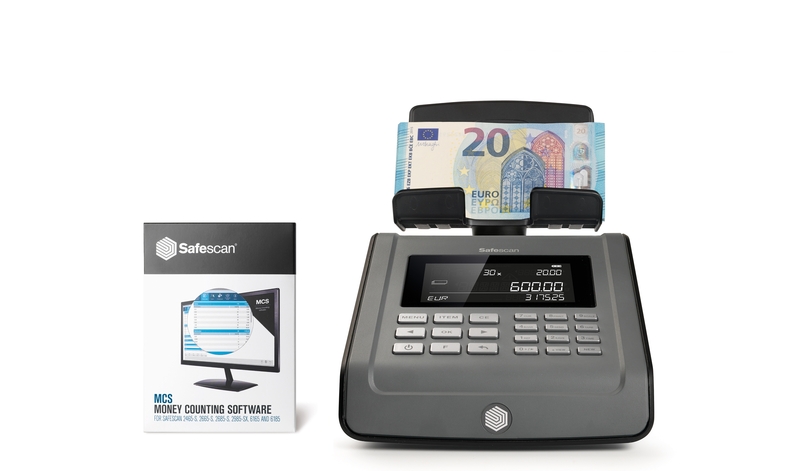 The Safescan 6185 is packed with the latest technology that allows you to count your entire cash register in two minutes. Connect your Safescan 6185 to the included Safescan Money Counting Software and save or export your counting results with just the push of a button. The Safescan 6185 is jam-packed with automated features that facilitate easy cash-counting at the end of a long, tiring business day. 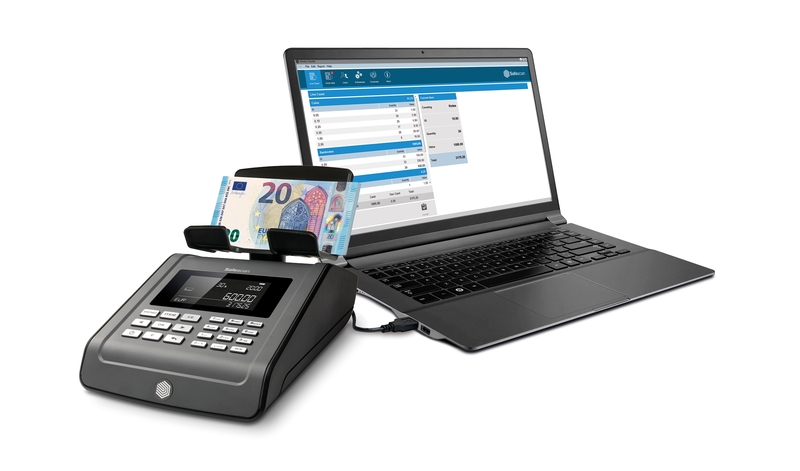 Count coins and notes whether they’re loose, bagged, rolled or bundled; add in credit card and check payments; tag each count run with a reference number and time stamp; automatically deduct the day’s starting cash from the total: the 6185 is designed to be the ultimate all-in-one, time-saving cash counter. 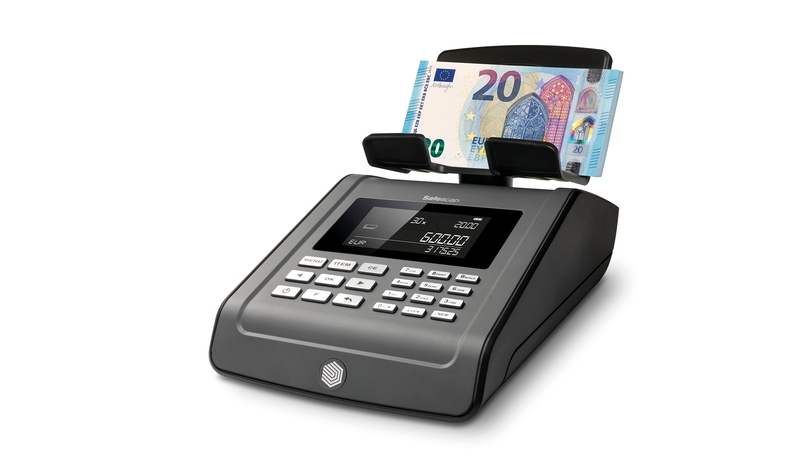 The 6185 uses sophisticated currency-weighing technology to quickly and reliably count coins, banknotes and non-cash items such as vouchers and tokens—faster and more accurately than the most experienced cashier. We designed the 6185 for ultimate convenience. Thanks to the calibrating weight integrated into the heart of the system, the 6185 is always ready to use, even if you’ve moved it from one place to another. Starting with the smallest denomination, place each coin type on the scale in the supplied cup, then each banknote type in small stacks. The 6185 weighs and counts each denomination and adds it to the total value. Voilà! In less than two minutes, your whole till has been counted. In addition to loose coins and notes, the 6185 will count coin rolls, coin bags and bundled banknotes with ease. Need to include non-cash items such as vouchers, coupons, tokens or chips? No problem. You can quickly teach the 6185 to automatically recognize the weight and value of any item. The adaptive count algorithm of the Safescan 6185 allows the device to adapt itself to weight tolerances. These may occur due to the condition of the banknotes that are counted or when counting 2 versions of banknotes (old and new, which usually have a different weight) within the same denomination. The 6185 has an intuitive control panel and a large, crisp display that puts other products to shame. A number pad and nine clearly labeled buttons provide easy access to the 6185’s many features. The spacious LCD screen tells you exactly what you need to know: the selected currency and denomination (or customized non-cash item), the quantity and amount per item type, and the total result. • Include the value of each check and credit-card slip in your total count. • Use the REF function to tag the count with a till or cashier reference number and handy time-date stamp. • Use the BANK function to subtract the register’s initial amount and instantly see the day’s actual earnings. Central banks regularly issue new or revised banknotes and coins. Safescan’s dedicated currency management team makes sure your 6185 keeps pace with these changes. We notify you whenever there’s an update; all you have to do is install it using the USB port on the back of the device. To make your administrative task even easier, the 6185 can automatically print your complete results to the optional Safescan TP-230 thermal printer, or export them to the optional Safescan MCS-6185 software. MCS provides you with comprehensive, automated cash flow management and insight using advanced filters and detailed breakdowns for each employee, register and denomination, including your customized non-cash items such as vouchers and tokens. Not ready to process the data just yet? No problem; simply save it to the 6185’s internal memory. The LB-205 rechargeable battery adds freedom of location to the Safescan 6185's many features. With up to 30 hours of mobile use, this lithium polymer battery lets you count up your entire till whenever and wherever it's convenient. Shave even more time off your cash-counting task by pairing the 6185 with a SD-4617S or 4141 series cash drawer and the removable 4617CC / 4141CC coin cups. No need to fumble with getting coins out of your cash drawer, and no need to calibrate first: the 6185 is already programmed to recognize these cups. The Safescan 6185 is standardized to work with 33.5 gr coin cups. Some cash drawer manufacturers however may use cups with a different weight. To accommodate this, the 6185 is able to calibrate a second coin cup, to ensure maximum compatibility. If you order more than two products, special shipping rates apply. To ensure a fast and accurate delivery of your order Safescan will provide a custom quotation with the best shipping rate possible for your order. 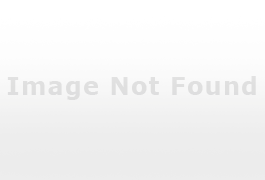 This quotation is made after you placed your order. We work hard to keep our shipping rates as low as possible. To ensure the fast, accurate delivery of your order, we use the reliable services of UPS. Please see the table of shipping rates ‣ for detailed information. If we receive payment for your order before 16:00 CET, we will process your order that same day. Provided all items are in stock, you will receive it in 4–5 business days. Orders placed on weekends and public holidays will be processed the next business day. The average delivery time is 4–5 business days, depending on the country to which the order is shipped. Please see our table of delivery times ‣ for detailed information.